There’s nothing like a pop of color to welcome people to your site. It takes a good designer to create an bold and colorful site – choosing the wrong color palette or hues that simply don’t match can leave your site looking gaudy and tasteless. And too many colors can leave your visitors confused, especially if they can’t easily find what they are looking for. But when used wisely, color has the ability to affect the mood of your visitors. Makes people feel welcome, comfortable and relaxed with blue hues or sell your sales pitch with an aggressive shade of red. Whatever color scheme you choose, a great deal of creativity goes into designing a bold and colorful theme. To get you inspired, I’ve gathered a collection of stunning WordPress themes that make great use of strong color. Many of the designs feature flat design and responsive layouts – both hot trends right now. Have you come across a beautifully bold and colorful WordPress theme? Let me know in the comments below. A beautiful and fun grid-based theme that uses imagery to engage visitors to your site. The theme is responsive and looks stunning on mobile devices. 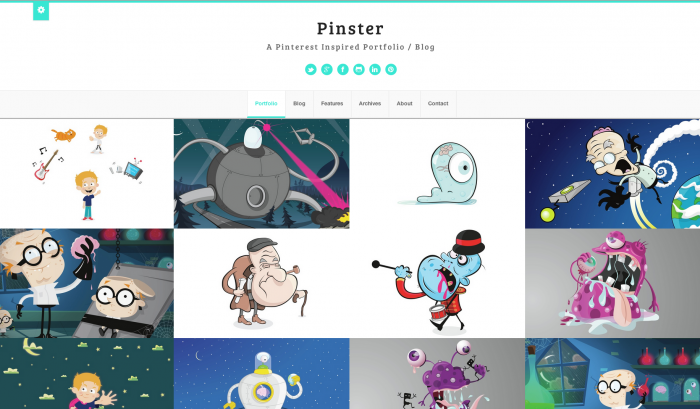 An awesome bold and responsive portfolio theme that displays your work in blocks of color. Show off your freelance or creative agency’s work with this attractive theme. Complete with a responsive design, Volumes features a filterable portfolio, custom widgets and page templates. Advertise your business with this bold, clean and modern theme. Business Essentials features a responsive design and page templates for staff, careers, home and case studies. A cool and colorful business theme that offers flexibility, responsive design and multiple layout options. A stunning business theme that makes the most of your images and allows you to showcase your team, their skills and their quirky hobbies. Draw attention to your brand with this bold, flat and ultra colorful theme, complete with transitional effects. A responsive blog and portfolio theme that lets you showcase different post types, such as images, galleries, sliders, maps and video in a full-width design. Showcase your business with this flat, functional and modern design. This responsive theme includes seven layouts. LA-Band is a slick and bold theme designed for musicians and creative types. This theme comes with 25 color schemes and an in-built audio player. A gorgeous portfolio theme for creatives and companies wanting to showcase their business with a flat and minimalist look. The theme is fully responsive and features smooth navigational flow. Concept 1 offers a stunning and modern flat design with a fully responsive layout, retina ready, unlimited sidebars, three pre-build homepage layouts and unlimited slideshows for pages. A clean and modern corporate and business theme that can be used as an eco/green business and portfolio theme. ECOBIZ features six pre-defined skins (blue, green, red, orange, dark and brown), three slideshow types and portfolio and product post types with categories filter. DK is a beautiful photography and portfolio theme featuring custom post types, four homepage styles, a fullscreen slideshow for photo galleries and 10 page templates. Delight is a functional and clean theme featuring a fullscreen background, unlimited skins, Google web fonts and slideshows. A colorful and responsibe theme designed to showcase your app or corporate site. Grizzly is fully responsive easy customizable and comes with unlimited styles. Zwin is a simple and colorful professional online vcard theme. The theme features a beautiful portfolio with sliding effect, resume and contact details with a Google map. An easy to customize and professional theme that includes unlimited color schemes and two live previews. Mercor is an eye-catching responsive eCommerce theme that features many layout options and unlimited color variations. The theme comes with options so you can modify the layout, styling, colors and fonts. “Designed for users, not geeks” is the tagline that accompanies this fully responsive theme. Radiant WP features a skin builder and 10 homepage templates. A grid-based, fully responsive theme featuring bold colors, unlimited color posts and audio and video posts. SquareGrid is a fully responsive grid-based portfolio theme that comes with five different layouts and supports image, audio and video posts. A colorful business theme with unlimited colors, custom widgets, shortcodes, a full-width slideshow and translation-ready. 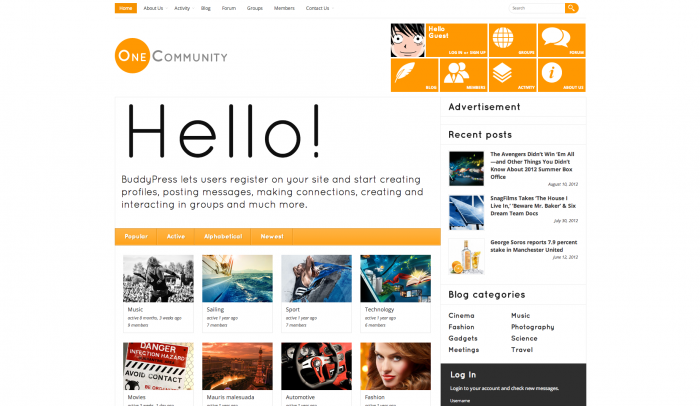 OneCommunity is a responsive BuddyPress-ready theme and includes a wide layout, three homepage options and nine color variants. An eye-catching and responsive charity, non-profit or fundraising theme featuring two-column page layouts, slideshow support, three alternative styles, widgets and drop down menus. Trymee is a simple and responsive theme that offers a clean corporate design. The theme features a slider manager and form builder. A clean and stylish responsive corporate theme that includes a color manager and is easily customizable. 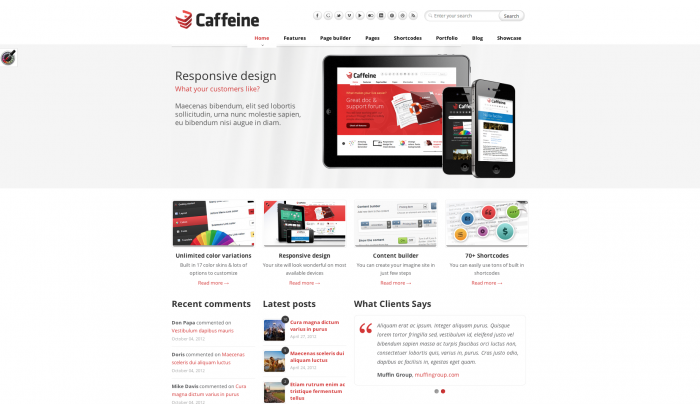 Caffeine is a fully responsive and easy to use theme that gives you full control over all available elements, sizes, fonts, colors and text. Mineral offers a flat, modern and clean design that is fully responsive and features parallax scrolling. The theme comes with options to modify stylings, colors, fonts and layouts. It is the ideal theme for a creative portfolio or photography site. A premium theme that is versatile and functional and offers a colorful and modern design. The theme features multiple layouts, shortcodes and widgets. Jarvis is a gorgeous one-page responsive parallax theme that is ideal for corporate, agency, non-profit and freelance websites. The theme features 12 homepage style, background video support, Mailchimp subscription support and six navigation styles. Prestige is a portfolio theme featuring a minimalist design and colorful pages. The theme comes with a contact form, slider, built-in gallery lightbox with video support and social icons. The ideal creative agency theme, Masculine features a flat and modern design with a pop of color. The theme has a responsive layout, custom backgrounds and a customizable homepage template. Disillusion is a bright and eye-catching responsive theme perfect for a creative portfolion. The theme comes with two demos, a simple design and another that offers advanced features. 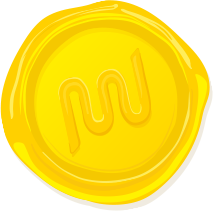 A masonry-based theme featuring smooth loading action. Mila showcases your images and is fully responsive. Parasponsive is a fully responsive parallax theme featuring Google fonts, custom widgets and it’s retina-ready. A stylish and responsive portfolio theme that comes with unlimited feature colors, fullscreen sliders and video pages, YouTube and Vimeo support and shortcodes. Simon is a colorful and minimalist theme that is ideal for photography and portfolio sites. The theme features a responsive grid-based design with unlimited colors. A minimalist theme featuring a powerful page builder and a user-friendly interface. The theme has 12+ skins/colors. Acoustic is a bright theme ideal for DJs, musicians, bands, collectives, club owners, music producers, events producers – basically anyone in the music industry. The theme comes with event management, custom post types, widgets for artists and discography managements. A simple and responsive help desk theme that features bbPress integration and the ability to create multiple FAQ pages. Panic Station is a beautiful business theme that features an easy-to-use page builder, responsive design and a portfolio gallery. Resolution is a clean and responsive theme that supports post formats (galleries, video, audio, images) and gives you control over colors and fonts. The theme comes with multiple layout variations. 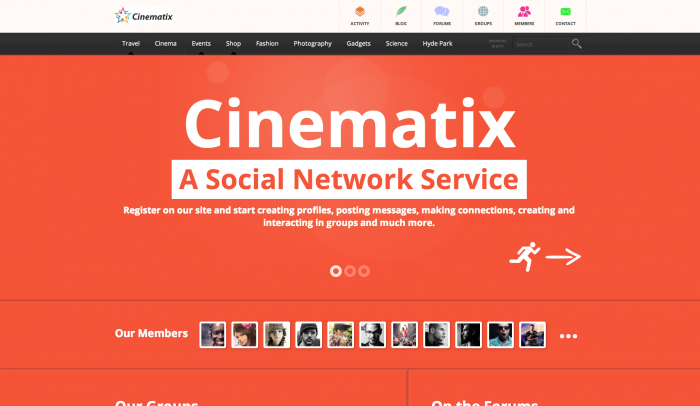 An attractive and professional flat theme with parallax scrolling. Coffee & Cream features a responsive design, custom widgets and a revolution slider. A cute and responsive theme perfect for a creative portfolio or personal blog. Halftone can feature blog and work posts on the homepage and a Google map and contact form on the Contact page. A sleek and attention-grabbing fully responsive parallax theme that features a fullscreen homepage, an AJAX newsletter signup form with built-in support for Campaign Monitor and MailChimp, an AJAX contact form and styling options. Aeolus is a clean, simple and vibrant theme with high contrast colors and a flat design. It is perfect for portfolio, business or personal sites. Cherry is responsive theme with 10 coloured skins, extensive theme options, a drag and drop layout and a starter child theme included. A beautiful and minimalist one-page theme for corporate, agency, non-profit or freelance sites. Versi offers two homepage options, a responsive design and customizable backgrounds. Quickly and easily create and customize a “Coming Soon” page with this theme. You can upload your own background and control the font colors as well as show or hide any elements of the theme. Jam Studio is a colorful one-page long scrolling theme with attractive animations. A fully responsive theme with a fresh and minimalist design, Echolake features slider and contact form managers. Eleg features a clean and simple design and includes a multi-color layout, revolution slider and a fully responsive layout. A brilliant theme that feature a responsive design. Easily customize background and font colors, layouts and page templates. A Tumblr-style theme, which features two layouts – one for blogs and another for a grid view. It’s easy to change the main color style with custom options and use post formats. OldCar is ideal for a personal blog or portfolio. A responsive theme ideal for creative types searching for a design to showcase their work. Pallas comes with a skin manager, flexible portfolio contents, customizable colors and 100+ shortcodes. Featuring a responsive design, Primum comes with a layout builder, slider manager and 17 built-in color schemes. Fresh offers a fresh and responsive design with two homepage options, logo uploader, shortcodes, Google web fonts and eight custom widgets. Scopic is a personal timeline Tumblr-style blog featuring media post formats for images, videos and music. Chamfer is a one-page responsive portfolio theme that’s retina-ready. Showcase your work, blog posts and photos with this responsive grid-like theme. Iconik features a fullscreen image slideshow where you can play Video, YouTube and HTML5 videos. A cute and stylish theme that includes newsletter signup, contact form, jQuery countdown and six color changer. A portfolio theme with four color options and a clean design. Primely is a colorful theme ideal for bloggers and boasts WP3 menu support, custom admin panel with no branding, multiple widget areas, custom post types for portfolio and testimonials and custom widgets. Showcase your business with this responsive and minimalist theme. Equipe features a clean design with options available to modify the layout, styling and fonts. 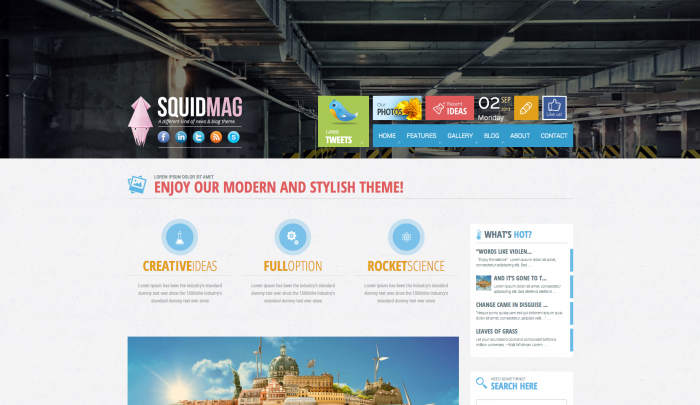 SquidMag is a modern and clean theme that comes with unlimited color options, a fully responsive design, an advanced admin panel with a drag and drop interface and various portfolio and blog styles. Create a BuddyPress community around this theme, which features 10 bold color schemes, a responsive design and a wider layout (1280x). Ageless is a bold and colorful theme that is responsive optional. The theme comes with unlimited colors, various layouts and a revolution slider. This Pinterest-esque is ideal for showing off photos, videos and galleries and includes a great blog design and simple customization options. xSquare is packed with features, such as sliders, an in-built color picker and the ability to customize layouts. Demo content is include. Nineteen color schemes come with this bright and colorful theme, which also features eight scroll effects, two post style, a drag and drop page builder and infinity scroll. Don’t be fooled by the greyscale homepage image. Singlet is a colorful, clean and responsive theme that comes as a one-page portfolio design. An ideal theme for freelances and creative agencies. Revusion is a flat, modern and clean responsive theme complete with several different layouts and revolution slider. Showcase your business, portfolio or personal site with CircleZ. The theme boasts two versions – with or without a feature image, as well as a gallery filter, 404 page and Google Map and Twitter integration.